Cameron didn’t seek help and no one – including us and his friends at Uni – knew that he was suffering from depression. 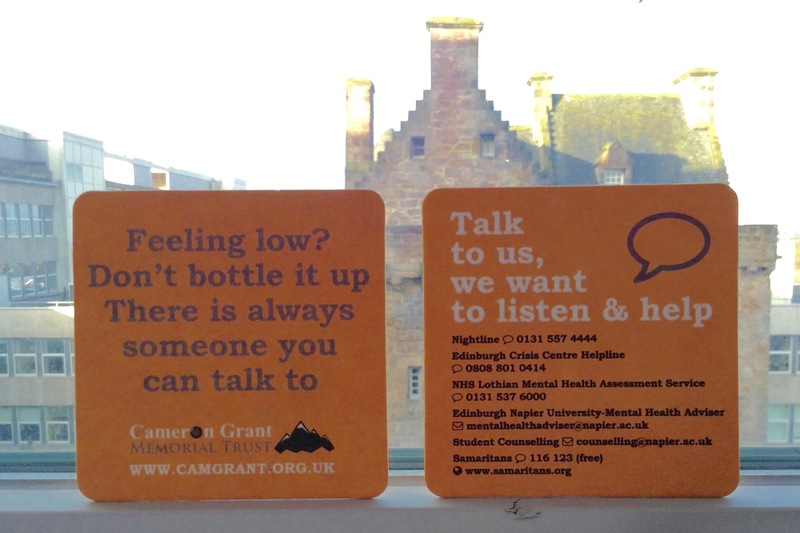 We produce Cameron’s Coasters, customised drink mats, which we send to schools, universities, local pubs and sports clubs, and other communities to encourage people to get help. 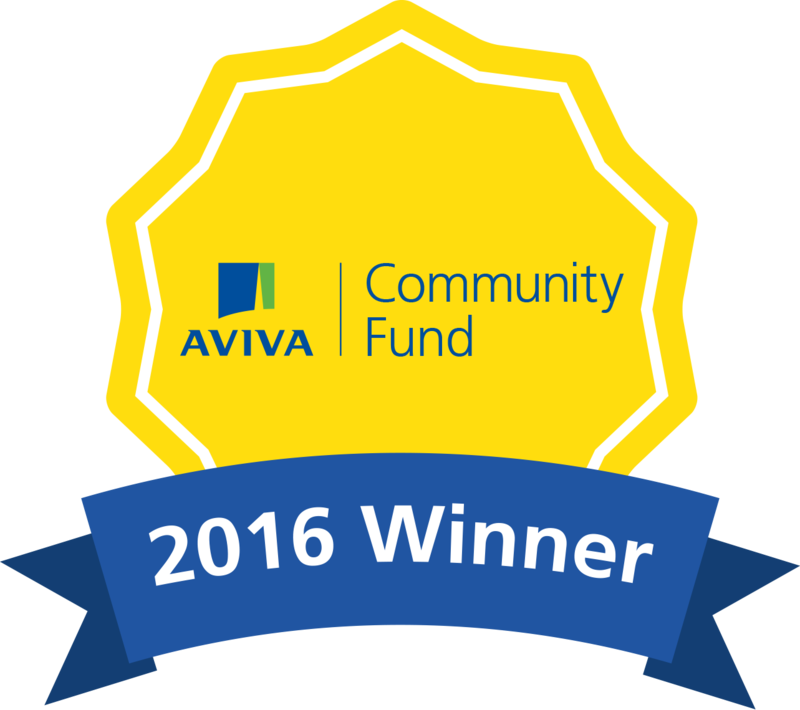 Aviva made this excellent video about Cameron’s Coasters: Could these drinks coasters save lives? The aim is to put relevant helpline numbers on Coasters, to catch someone who is vulnerable with the right message at the right time. We have produced drink mats for Royal Holloway, University of London, where Cameron studied Geology, Churchill College, Cambridge and Edinburgh University and many more. To date we have sent out over 540,000 coasters to: 70 universities, 19 Cambridge Colleges, 11 schools, 4 GP Practices, Dorset Healthcare University NHS Foundation Trust, Ricoh Arena and Wasps Rugby Club, other local sports clubs, IBM, Paddy Power Betfair, 16 Police Federations and the White Lion, our local pub. Cameron’s Coasters work just as well with a cup of coffee or a glass of water as they do with a pint of beer, and they are even quite handy around the house! Please see the gallery at the bottom of this article for examples of Coasters used in these various locations. All our Coasters are the same on one side, but on the other, the details of who to contact for help locally are tailored to each community where they are used. 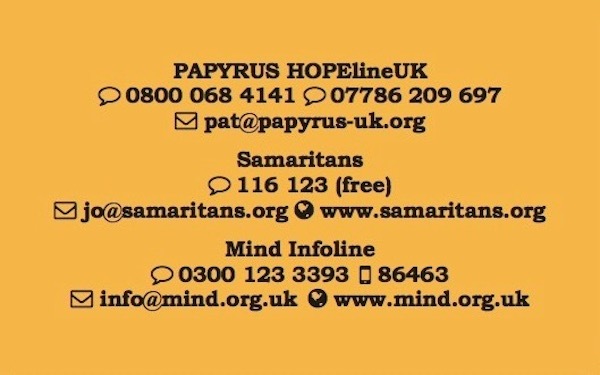 We also have a “national Coaster” with contact details for national charities: PAPYRUS, Samaritans and Mind. We will add new images to the gallery below as we produce more of Cameron’s Coasters. 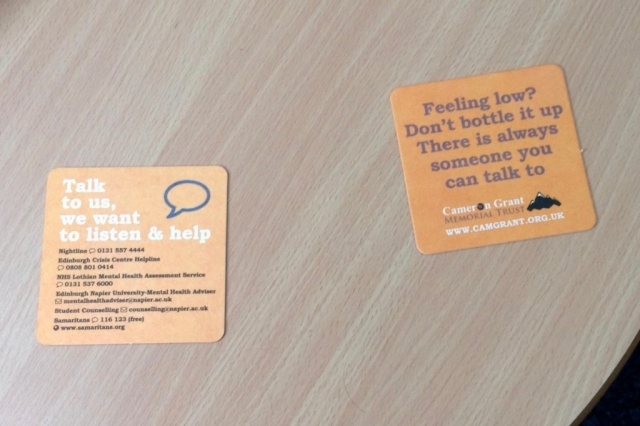 More recently we have started to produce a plastic card version of the coasters; the cards carry similar help information, but are more enduring and are the size of a credit card so can easily be put in a wallet. As with the Coasters, for the most part, we customise the cards for each community that uses them. 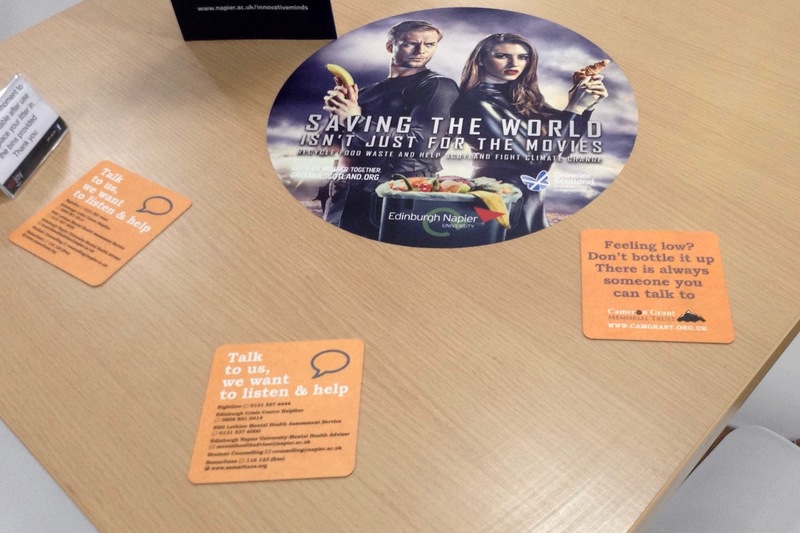 The pictures here are of a Card with National Helplines; for further examples, please see the gallery linked from the bottom of this article. In April 2017, we asked the first 53 colleges and universities to use Cameron’s Coasters for their feedback, and you can see what they told us here at SurveyMonkey. We are very grateful for such a positive response! 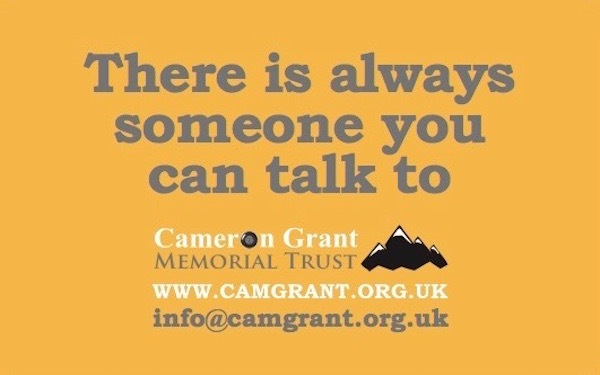 It has been great to work with the Cameron Grant Memorial Trust this year to promote the importance of talking about mental health with students and young people. The drinks mats have been circulated throughout our campus and are regularly used by students, who have commented on what a great idea they are. 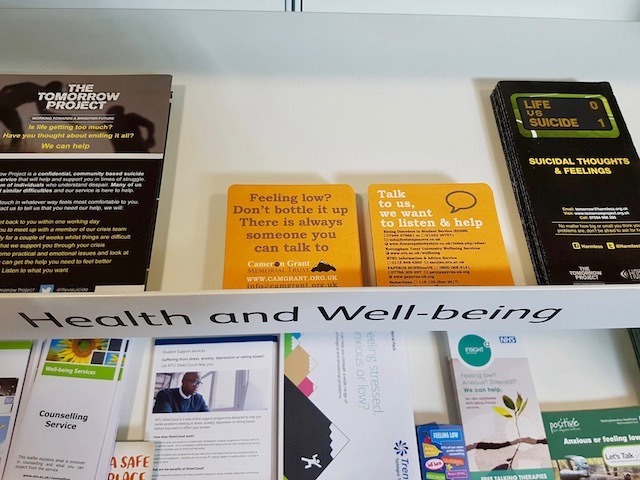 Mental Health is high on the agenda for students at Royal Holloway, and the support from the Trust as our main charity for Mental Health Awareness Week has further enhanced this. 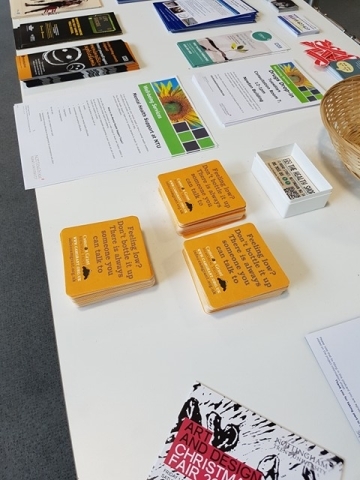 For the first time this year we’ve established a Mental Health rep on our Equalities Council, which will help empower students to talk about mental health and tackle issues on our campus. 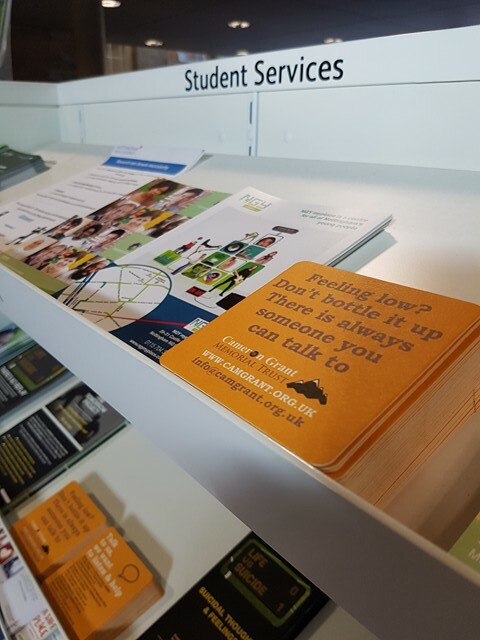 Another Mentor told Carol that one of their mentees had booked an appointment with the Centre for Wellbeing the week after receiving the Coaster; they had been feeling overwhelmed and were did not know what to do. The mats have arrived and they are brilliant! As a result of putting them out over just one weekend I have seen a couple of, at the moment reluctant, male students. But they have come forward and the drink mats have done what they are supposed to do! Thank you! Cameron’s Coasters are wonderful and the students love them! Thank you again, they are a great resource for us and we would love some more. 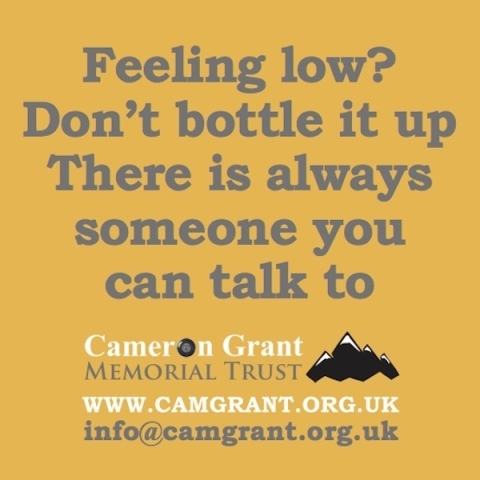 This is a project we have just started in the hope of encouraging people to ask for help rather than suffering in silence as Cameron did. 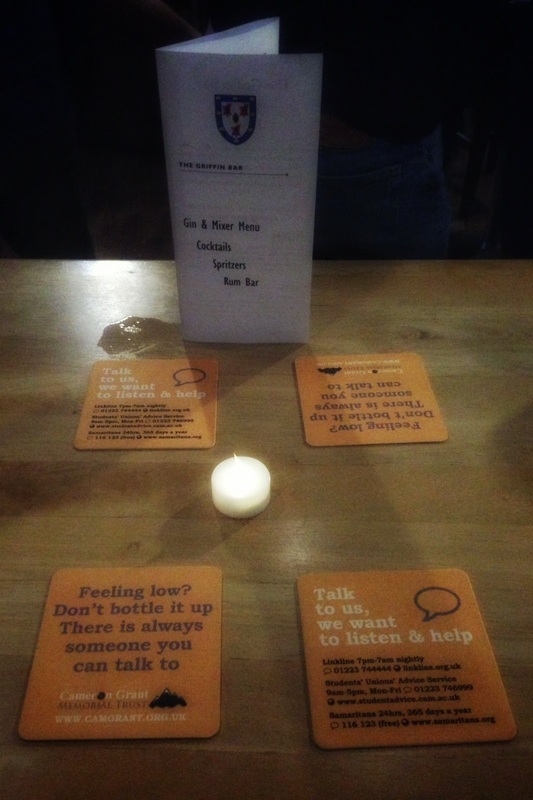 If you know of a community that might benefit from Cameron’s Coasters, then please get in touch on info@camgrant.org.uk.